Southern Fried Chicken is a British-based fast food chain, which is a franchise network in U.K. and several company-owned worldwide with over 700 stores in 70 countries. Southern Fried Chicken was founded in the 1970s by Arthur Withers. In the 1970s Withers travelled to America to work for Barbeque King; there, he improved his knowledge of the commercial fast food business. Withers made a visit to Greenville, South Carolina, where he learned about fried chicken. The company is currently headed by his son, Andrew Withers. 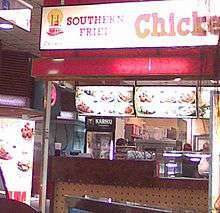 Southern Fried Chicken (franchise) in Forum shopping centre foodcourt, Helsinki. The company has 700 franchises worldwide. In 2012,the company opened their first company-owned branch in Whitley, Reading (England). The first drive thru restaurant in the UK opened in December 2012 in Whitley by 2 franchises. In 2011, Andrew Withers took part in the Channel 4 documentary series Undercover Boss, where he went undercover to work at various franchises in the UK. ↑ "SFC". Southern Fried Chicken. Retrieved 2015-09-20. ↑ Tift, Duncan (2013-02-04). "SME / Entrepreneurs invest £400,000 to bring fast-food concept to Wolverhampton". Thebusinessdesk.com. Retrieved 2016-04-04. ↑ "Undercover Boss - Features - Boss Interview: Andrew Withers". Channel 4. 2011-07-06. Archived from the original on July 17, 2011. Retrieved 2011-08-03.